The Ballas are a Los Santos based street gang that appears in Grand Theft Auto: San Andreas and Grand Theft Auto V.
In GTA San Andreas, they act as the primary and first antagonistic group during the early game. During the beginning, the Ballas are the most powerful and influential street gang in Los Santos. In GTA V, they dress the same as they did in GTA San Andreas, but only attack the player if they have been taunted or if one shoots a gun in their territory. They draw significant police presence, and driving through their territory is a good way to distract police following you and escape a wanted level. The Ballas territory in GTA V is the entire neighborhood of Davis. Information regarding the founding of the Ballas or the date in which they were formed is unknown. However, they have been around since the 1970's. They have maintained a traditional, intense and bloody rival with the Grove Street Families. Specifically when the gang war started is unknown, but the rivalry between the two gangs was in full swing as early as 1987. The reasons or date of their rivalry with the Varrios Los Aztecas and Los Santos Vagos is unknown. However, it is likely due to territorial reasons due to the close proximity of territories. The Ballas were responsible for the death of Beverly Johnson (mother of Sweet and Carl Johnson) in 1992 just before CJ's return. The Ballas used a Green Sabre vehicle to hit the Johnson House with the intent to kill Sweet (leader of the Grove Street Families). However, Sweet was not home and his mother was hit instead. The Ballas also establish underground ties for drug supplies with Grove Street OG Big Smoke before CJ's return - a secret relationship which is initially unknown to Sweet, CJ and the Grove Street Families. It is likely that the Ballas controlled the area of Temple prior to 1992 due to the presence of a fourth Ballas set known as the "Temple Drive Ballas" as well as graffiti of the "Temple Drive Ballas" that still exists in the area. However, during 1992, Temple is under the control of the "Temple Drive Families" (a family set). It is likely that the Temple Drive Ballas are defunct/inactive. The Ballas are the Grove Street Families primary enemy and most influential gang in Los Santos. In the beginning of the game they are the largest and most powerful street gang in Los Santos. They are enemies with all Family sets (especially the Grove Street Families) and the Varrios Los Aztecas, and have establish ties with the San Fierro Rifa and the Loco Syndicate for narcotics, and the Russian Mafia for weapons. Their relationship with the Los Santos Vagos is largely "hit-or-miss"; this is because the Ballas and Vagos are natural enemies on the streets (and will act with hostility upon spotting each-other), but briefly collaborate for mutual interest in the drugs trade - especially in relation to Big Smoke's crack empire. The Ballas also collaborate with CRASH, primarily for street intelligence. At some point, Ex-Grove OG B-Dup also starts to associate and collaborate with the Ballas for the interest of drugs. Upon CJ's return to Los Santos, the Ballas attempt to finish of the Grove Street Families during the first mission Sweet & Kendl through a drive-by shooting on Sweet, CJ, Big Smoke and Ryder after leaving Beverly Johnson's funeral but miss and are only successful and destroying Big Smoke's car. The OG's must then make it back to Grove Street in one piece on bicycle while avoiding the Ballas car. During the early game, the Ballas are very successful at spreading crack-cocaine into Ganton and Grove Street in an attempt to weaken the Grove Street Families. By doing this, they turn members into weak and hopeless addicts while influencing high-ranking members with the money that can be made from drugs - taking them away from gang-banging (as is the case with B-Dup). However, one of their crack houses on the Idlewood/Ganton border is destroyed by CJ and Ryder on Sweet's orders during the mission Cleaning the Hood. This decreases their crack influence. In retaliation for the destruction of the crack house in Idlewood, the Kilo Tray Ballas attempt a drive-by shooting in Grove Street during the mission Drive-Thru. However, CJ, Sweet, Big Smoke and Ryder are able to catch them on the way to Grove Street when pulling out of a Cluckin' Bell drive-thru in Willowfield. A car chase follows and the Ballas car is destroyed - though Big Smoke does nothing and is more concerned with eating his food - providing one of the many early in-game hints for his true connections with the Ballas. The Ballas eventually suffer a major loss when many members of the "Rollin' Heights Ballas" and the "Kilo Tray Ballas" are killed in a drive-by shooting that involves Sweet, Big Smoke, Ryder and CJ during the mission Drive-By. CRASH tips off all gangs in Los Santos with the exception of the Varrios Los Aztecas about a weapons and ammunitions train during the mission Catalyst. All gangs prepare to rob it - but the Ballas and the Los Santos Vagos fail and the train is instead robbed by the Grove Street Families via CJ and Ryder. The Ballas eventually lose Glen Park to the Grove Street Families in a gang war during the mission Doberman. This puts the Ballas on a more equal footing with the Grove Street Families and their position as the dominant and most powerful gang is threatened. The Ballas attempt to regain their dominance by wiping out the Grove Street Families through a gang war on Grove Street itself in the mission House Party; however, Sweet, CJ and other Grove Street members are able to successfully defend their territory and the Ballas fail. CRASH tips off CJ about a weapons deal taking place between the Ballas and the Russian Mafia at a Willowfield warehouse during the mission Gray Imports. CJ is able to disrupt the deal and members of the Ballas and Russian Mafia are killed along with the Russian Mafia shot-caller of the deal. A high-ranking member and OG of the "Front Yard Ballas" called Kane is then killed along with many other Ballas during a Ballas funeral at Vinewood Cemetery at the hands of Sweet, CJ and other Grove Street Family members during the mission Los Sepulcros. The Ballas then regain all of their power and influence back when Grove Street leader Sweet is shot and injured during a gang war and arrested while CJ is abandoned from Los Santos by CRASH during the mission The Green Sabre. The Grove Street Families fall apart with no leader or OG's and the Ballas begin cementing their influence by distributing crack cocaine again. All family sets are eventually wiped out or in hiding and the Ballas start controlling remaining Family territory - including Ganton and Grove Street itself, Playa Del Seville, Santa Maria Beach and Temple while regaining back Glen Park. The Ballas make no major presence and have no more significance in relation to the games story for the rest of the middle game chapters. However, the Ballas do make one minor appearance during one of the middle game missions. During Pier 69, CJ, Cesar Vialpando, and the San Fierro Triads ambush a drug deal between Ryder (on the behalf of Big Smoke) and the Loco Syndicate in San Fierro. Many Ballas make a presence during this mission to provide protection for Ryder. CJ and Cesar are successful at disrupting the drug deal and Ryder is killed along with his Ballas protection. For the rest of the middle part of the game, the Ballas make no more appearances until the "Return to Los Santos" missions/chapter is unlocked towards the end of the game. Following the release of Sweet from prison and the return of Carl "CJ" Johnson, the Grove Street Families win back their territory from the Ballas (specifically Ganton, Glen Park, and parts of Idlewood) during the missions Home Coming, Beat Down on B Dup, and Grove 4 Life and put an end to the remaining drug influence in Grove Street by killing the dealers. That same year, the Crack Palace operated by Big Smoke is destroyed and Smoke is killed in the final mission End of the Line, causing the Ballas to lose a lot of drug influence on the streets and if the player chooses, can take over all of their territories in Los Santos (as part of the gang war mini-game), completely wiping out the Ballas for good. 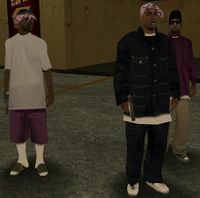 The Ballas are not central to the overall plot in GTA V as they were in GTA San Andreas; however, they are prominent in certain missions for Franklin Clinton. Early on, Franklin and Lamar Davis attempt to kidnap a Ballas OG named D for $40,000; however, Lamar accidentally reveals his identity to D, forcing him and Franklin to release D. While incarcerated, Chamberlin Gangster Families OG Stretch begins to associate with the Ballas. Shortly after Stretch is paroled, he arranges a drug deal in La Puerta, which turns out to be a Ballas ambush gone wrong when the LSPD show up. Some time afterward, Stretch arranges another drug deal with the Ballas for Franklin and Lamar at Grove St; however, Franklin and Lamar this time are accompanied by Trevor Philips. When Trevor demands a taste of the drugs Lamar was buying, he discovers that most of the brick was drywall, forcing Lamar, Franklin and Trevor to shoot their way out of Ballas territory. Shortly, before Franklin, Trevor, and Michael De Santa execute the Union Depository heist, Lamar is lured into another Ballas ambush by Stretch at the sawmill south of Paleto Bay; however, Lamar is rescued by Franklin, Trevor, and Michael. Should the player decide to save Michael and Trevor, Michael tracks down Stretch at the B.J. Smith Recreation Center and Park and kills him and any Ballas resistance. The Ballas are a black/Afro-american street gang that are easily identifiable by their purple gang color. The color is thought to denote respect on the streets; but could also be a reference to the ancient Roman upper-class. They are involved in drug trafficking/manufacturing (especially the crack cocaine trade), gang-banging, gang warfare, murder, prostitution, gun running/arms dealing, street violence, protection, vandalism, and degeneracy. They can be found walking and driving around their territory - often seen smoking marijuana, drinking malt liquor, and talking in groups. Like the other gangs, the Ballas will often flash their gang hand-signs as a form of representation. They will sometimes buy drugs from drug dealers. They also mark their territory with graffiti; however, Balla graffiti can also be found all over the city - suggesting an attempt to expand their influence out of South Central Los Santos. Upon spotting a Grove Street, Vago, Azteca, Rifa, Da Nang Boy, San Fierro Triad, or Italian Mafia gang member (especially Grove) - they will often react with hostility - usually resulting in a street-fight or a fire-fight/shoot-out. If they spot Carl Johnson, they will usually question him on his gang-banging status (if the player chooses to respond positively) they will attack. The Ballas are always likely to attack the player after completing the mission Drive-By while wearing green clothing. On the streets, the Ballas are either unarmed or carry the 9mm pistol or the micro-SMG sub-machine gun. In missions and the gang-war mini-game, they are more heavily armed with AK-47 assault rifles, baseball bats, MP5 sub-machine guns, Tec-9 sub-machine guns, and Pump Action Shotguns. During the final mission, the Ballas are also equipped with the M4 assault rifle. The Ballas are some of Los Santos' most notorious and successful drug dealers and suppliers (especially the crack cocaine trade). Unlike the Grove Street Families, the Ballas have no reservations about making money by selling drugs; the spread of crack cocaine into the Grove Street community is part of their strategy to wipe the GSF out. They are described by the Los Santos Police Department as being "lawless", "mindless", and thought to be uncontrollable and that attempts to infiltrate have mainly failed. The first member is slightly overweight, wears a dark blue chore jacket, dark blue khakis, white sneakers, and a purple bandana. The second member wears a purple ProLaps jacket, a black beanie, beige khakis, shades, and black/white sneakers. The third member wears purple khaki shorts, a baggy white T-shirt, sandals with knee high white socks, and a purple bandana. All Balla sets are allied and all fall and operate under the "Ballas" card while sharing similar traditions. Likewise, all sets wear purple and are all sworn enemies of the Family sets. The difference between the sets primarily rely on territorial differences aswell as a few differences in objectives and business. For example, the Front Yard Ballas are the most influential set when it comes to drugs (especially crack cocaine) - and are considered to be some of Los Santos' most notorious drug dealers. Likewise, it is the Front Yard Ballas that are mainly responsible for the weakening of the Grove Street Families through the distribution of crack cocaine into their territory (primarily from their crack house in Idlewood). On the other hand, the Rollin' Heights Ballas and the Kilo Tray Ballas are more focused on gang warfare. While the Front Yard Ballas weaken the Grove Street Families with crack cocaine, the other Balla sets commence gang wars and perform hit-and-run tactics such as drive-by shootings to finish them off. Although they are seen with Voodoos in some missions, the Ballas only have two gang cars: the Tahoma and the Majestic. The Tahoma is a lowrider and sometimes appears with Hydraulics. On one very important occasion the Ballas use a green Sabre to try and murder Sweet in a drive-by shooting at the Johnson House. Sweet, however, was not home and instead they end up killing his mother Beverly Johnson. The Ballas' favorite and default radio station is Bounce FM. Like with any other gang, the Ballas can be set to drive any vehicle the player chooses by modifying the cargrp.dat file. In Grand Theft Auto V, they drive Tornados, Buccaneers, and Peyotes, while Felons appear during Hood Safari, Rampage Three, and certain Property Management missions. Kane (deceased): OG and high-ranking/well respected member. Possible leader of the Front Yard Ballas but unconfirmed. Was killed while attending a Ballas funeral. "Little Weasel" (deceased): Originally a member of the Grove Street Families, defects to the Ballas and sells drugs. Possible OG and friend of high-ranking member Kane. Killed by CJ on Sweet's orders. Mark "B Dup" Wayne: Associate of the Ballas. Enters a drug/supply relationship with them while receiving protection. Melvin "Big Smoke" Harris (deceased): Associate of the Ballas. Hires Ballas for protection and drug trafficking. Killed by CJ. Lance "Ryder" Wilson (deceased): Associate of the Ballas. Enters drug trafficking business with them on Big Smoke's behalf. Killed by CJ. Alan Crawford (deceased): Manager of gangsta-rapper Madd Dogg. Has very close-ties and friendships with high-ranking Balla OG's - claiming that they are "like brothers". Possibly receives protection/security from them. Killed by CJ on OG Loc's orders. Big T (deceased): Ballas member, killed by the GTA Online protagonist(s) for Gerald G.
Little T (deceased): Ballas member, killed by the GTA Online protagonist(s) for Gerald G.
Small F (deceased): Ballas member, killed by the GTA Online protagonist(s) for Gerald G.
Terrance (deceased): Ballas member, killed by the GTA Online protagonist(s) for Gerald G.
D (deceased): Ballas OG. Killed by Stretch for setting him, Franklin, and Lamar up. Harold "Stretch" Joseph: (can be killed) Former Families OG, now an associate of the Ballas. Can be killed by Michael De Santa if the player chooses The Third Way. The Ballas were originally going to be called the "Flats" in GTA San Andreas. It is unknown why Rockstar changed this. The Ballas originally looked different in the beta version of San Andreas. An additional three different Balla skins can be seen in The Introduction video. The Balla with the white shirt, purple khaki shorts, knee high socks and sandals, and a purple bandana originally also wore a cross necklace. It is unknown why Rockstar changed this. There is a fourth Ballas set known as the "Temple Drive Ballas" but they never appear in the game or in the storyline. Graffiti tags in Temple still exist and can be tagged over by the player. Temple is instead controlled by the Temple Drive Families (a Family/Grove set). The "Temple Drive Ballas" are either inactive/defunct or were scrapped for some reason by Rockstar before the game's release. The rivalry between the Ballas and the Grove Street Families is loosely based off of the rivarly between the Bloods and the Crips in Los Angeles. Violence between the two gangs hit a peak during the early 1990's - largely due to the crack cocaine epidemic. A situation mirrored in early 1990's Los Santos. Their name is a play on the slang term "baller"; meaning a street thug that has made it big-time. Ballas means "Bullets" in Portuguese and Spanish. Ballas graffiti at the Skate Park. The graffiti for the Temple Drive subsection of the Ballas. The graffiti for the Rolling Heights subsection of the Ballas. The graffiti used for the Kilo Tray subsection of the Ballas. The graffiti used for the Front Yard subsection of the Ballas. Ballas members, as seen in "The Introduction"
Ballas gang members in GTA V.
This page was last modified on 21 June 2015, at 22:17.